In an insightful paper, Archer, Lavie and Hill (2018) argue that controversies regarding the health effects of dietary sugar, salt, fat and cholesterol are not driven by legitimate observations. Dietary intake estimates are ‘mere guesswork’ and not accurate measurements of dietary intake. Human memory and dietary recall are not valid tools for objective data collection because people are forgetful, often intentionally misreport and change their responses to offer socially desirable responses. Conversion of abstract concepts/answers to categorical data is pseudo-scientific and misleading. Archer, Lavie and Hill suggest that the answer may lie in metabolic differences among individuals, i.e. our ‘metabolic phenotype’. They acknowledge the resources required for metabolic phenotyping. There may be an interim, more achievable nutrition goal. Let’s shift our focus to objective measures of micronutrient status on chronic disease and away from an obsession with dietary sugar, fat, salt and cholesterol intake. The fortification of food staples beginning in the 1940s (iodized salt, vitamin D fortified milk, B-vitamin fortification of cereal grains) has had a tremendous public health impact. However, society has changed. With >85,000 food items in the market, people eating on the go, and a diet-disease discourse that creates confusion and increases distrust of the agri-food industry, dietary patterns are becoming increasingly diverse. While overeating may be prevalent, lifestyle choices may increase risk of over- and underconsumption of essential nutrients. Hidden hunger, a lack of essential vitamins and minerals to maintain health, occurs in people who are underweight, normal weight, or overweight/obese. Reports on the prevalence of hidden hunger often rely upon B-MBs. They need not. We should be adopting objective measures of nutritional status, i.e. serum 25(OH)D, serum ferritin, EPA+DHA, macular pigment density for lutein, etc. Vitamin D is the poster nutrient for my recommendation. The National Institute of Standards and Technology (NIST) and National Institutes of Health established a Vitamin D Metabolites Quality Assurance Program. Based on this, nutrition and medical researchers have begun unravelling important relationships between vitamin D status and health (see two examples below). It is possible to objectively monitor health status using many objective biomarkers: body weight, blood pressure, blood vitamin levels, blood (or red blood cell membrane) fatty acids EPA+DHA, serum cholesterol, glycosylated hemoglobin, C-reactive protein, serun ferritin for iron, etc). 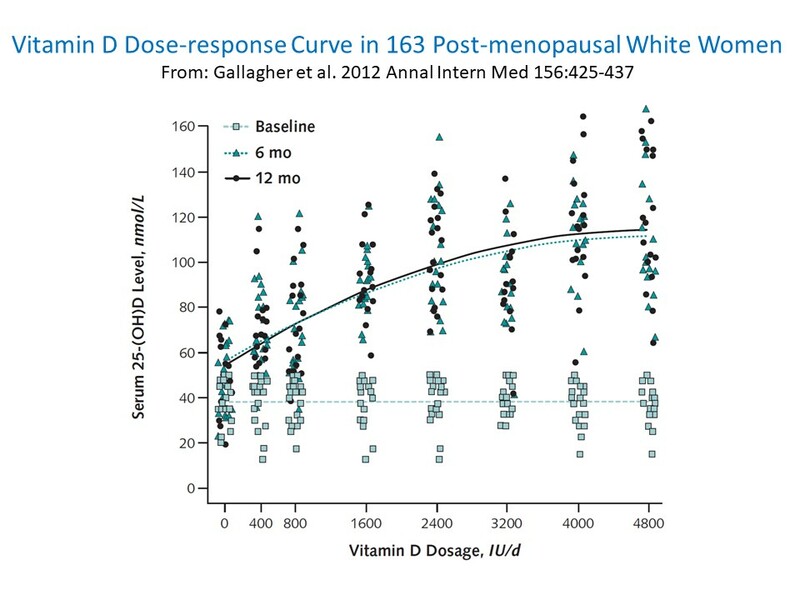 As seen in the figure below, we know that individual responses to a standardized vitamin D dosage differ. We can speculate about vitamin D-related polymorphisms but we still do not know why; mostly because individual responses have not been studied very broadly. A ‘metabolic phenotype’ may mean some individuals can consume more (or less) of a nutrient to maintain optimal micronutrient status. For most micronutrients, ‘optimal status’ is a vague term that needs to be defined further. However, if it is the availability of vitamins to cells, i.e. vitamin status, that affects cellular function and disease risk, then the dietary objective is to maintain ‘optimal status’ regardless of genetics. This hypothesis needs testing. By adopting objective measures of nutritional status, nutrition scientists and medical scientists can unravel diet-disease relationships and help end our obsession with food. It is time to move forward…..